During the summer months I work a lot in the barn. It’s perfect, I get to hang out with the curious and very nosy alpacas while I work. I just started harvesting goldenrod for the dye pot and have an indigo vat ready to go. Music is an integral part of my fiber art experiences. I love the Stones and have since I was just a wee listening to her older brothers records. 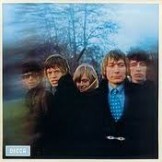 Between The Buttons has some great stuff on it and of course, has Brian Jones.